This easy-to-use book helps you acquire a wealth of fascinating information about plants. There are 130 pages with text, each facing 130 pages of beautiful illustrations. Each page is a separate subject. Included is a coloring guide for the realistic illustrations. The illustration pages are composed of scientifically accurate line drawings with the true sizes of the plants indicated. Using colored pencils and the authors' instructions, you can color the various plant structures to stand out in vivid clarity. Your knowledge of plants increases rapidly as you color the illustrations. There is a balanced selection of subjects that deal with all kinds of plants. However, the emphasis is on flowering plants, which dominate the earth. Drawings show common houseplants, vegetables, fruits, and landscape plants. They also show common weeds, wild flowers, desert plants, water plants, and crop plants. 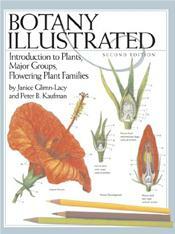 Botany Illustrated, Second Edition, has three sections. An Introduction to Plants gives you facts on everything from cells to seeds. The Major Groups section is from fungi to algae, ferns, conifers, and flowering plants. In Flowering Plant Families are magnolias to asters, and water-plantains to orchids, with the families of major interest included.